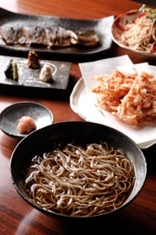 SASUGA is famous for “十割‐JUWARI” SOBA. 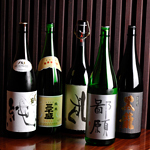 JUWARI means “pure” or “unadulterated”. they use a pasta machine. or seaweed with buckwheat flour. and never use some wheat or others. But it’s very charming, sweet smelling, and tasty. It’s very simple and standard soba served with some soy-based dipping sauce. Zaru soba with sakuraebi(=little shrimps) tempura. This soba flour is ground with some husks of buckwheat, so the color is a little brownish or blackish. It’s served with duck dipping sauce. The noodles is cold,but the sauce is hot (not cold). This soba has many toppings―egg,sliced cucumbers,some seaweed etc. We serve some hot and cloudy water in a china pot with a dipping type soba. This is SOBAYU—in which soba was boiled. It’s very nutritious, so after you finish eating soba, please pour this water into the sauce cup, and drink it with the left sauce. Hot noodles, Cold noodles，Japanese omelet, Shrimp tempura, and Chef’s special. Copyright 2011-2015 Ginza-sasuga. All Rights Reserved.